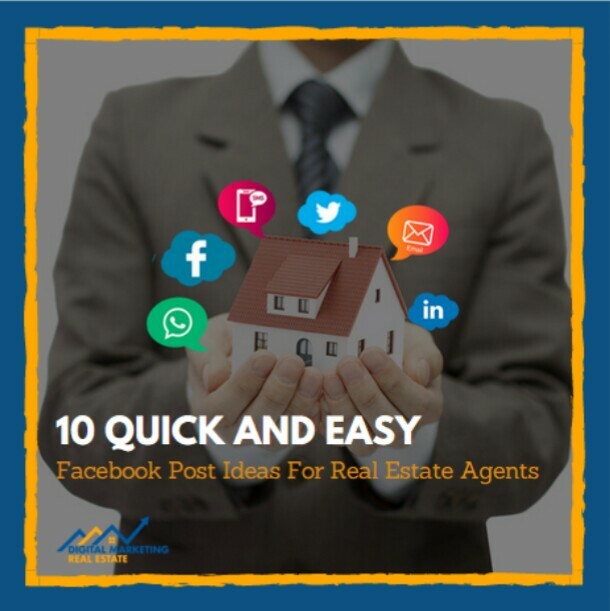 In this article, we're providing you the top 10 quick and easy Facebook posts ideas for real estate agents. So, let's dive in! A real estate is a property which is unmovable and consists of land along with its natural resources. Being in the market of real estate is really complicated and not an easy task. Being in a real estate market it is your duty to create a luxury home which is demanded by your buyer. You should stand on the expectations of your buyer as it is your responsibility. To create this you need to be active on social media through which buyers can reach you. Social media has a great impact in the modern era. To communicate we use various social websites than why not to digitize your business on a social platform and use social media marketing for real estate. Twitter, LinkedIn, Facebook is the top rated websites and among these the major role is played by Facebook. The real estate marketers can actually earn a profit by advertising on a social media platform. It gives you a bigger platform to expand your business. You can get a larger audience and it also ensures your online presence. Local SEO for real estate agents is necessary for free trafficking, you can compete with local real estate agents which gives you an opportunity to get the quick results. Your real estate agent can connect to the clients online and it also builds a better relationship with your client. If you post advertisements of your real estate property on social media, then more people can reach you. It is better to keep the price less than the market price as this will give you more customers and than a bidding process takes place among the interested buyers. The highest bidder will be the owner and you will actually gain profit in this process. Due to the bidding process, the price actually increases to the market price or maybe a bit more than that which makes a good profit. Advertising on Facebook can really help you reach thousands of people in a single community as they will get to know about your listings. Posting helps to build a better relationship with your clients by making them engage in your activities like open houses, listings, speaking and even your personal events like family functions. This enables the trust of the client on you. You can post about your listings which mean that you can post pictures of your real estate property. The photo will build curiosity among the buyers to see the whole property by fixing the appointment. It is not necessary to post business-related posts on your account because this might get boring every time. You can post some other engaging stuff which will add fun elements to your account. You can even post memes that are funny as they will attract the buyers. You can post a survey if you want to learn about something you can see the response of your audience. You can post the celebration stories of client success in purchase or sale because this can make your clients happy and also the other followers may appreciate your step. You must provide relevant information about the property which your homebuyers might be interested in knowing. For example – the important things which a buyer would like to know about buying the house in that community. You can feature the upcoming events in your post related to the area that you can feature. You can connect to other local businesses and feature the owner on your fan page. 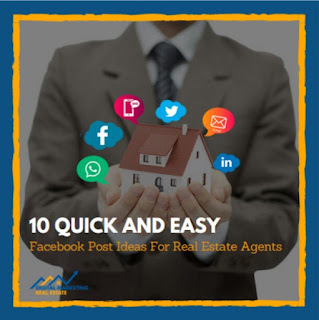 So, these are some of the Facebook post ideas for real estate marketing through social media. The social media has really changed the perception of the world. Real estate marketing has been highly influenced by social media. Using Facebook for real estate marketing is endless. The social media marketing for real estate has been really transformed. Technology is foremost in front of every business channel. Not only in the real estate world but social media plays important role in promoting every kind of business. Social media is the platform to connect with big companies and brands. Social media marketing is easy, effective and can reach billions of people but it is really necessary to use it in the right way.